How to size a muzzle. Our Wire Basket muzzles are an excellent option for anyone interested in managing dogs who may have the potential or a history of biting. These muzzles are a great option for dogs who need to wear a muzzle for an extended period of time as they allow maximum air flow as well as allow dogs to easily drink through. They are made of a heavy-duty chrome which is durable and dependable. We offer a wide range of sizes and shapes of wire basket muzzles that allows you to choose a muzzle that best fits your dog. 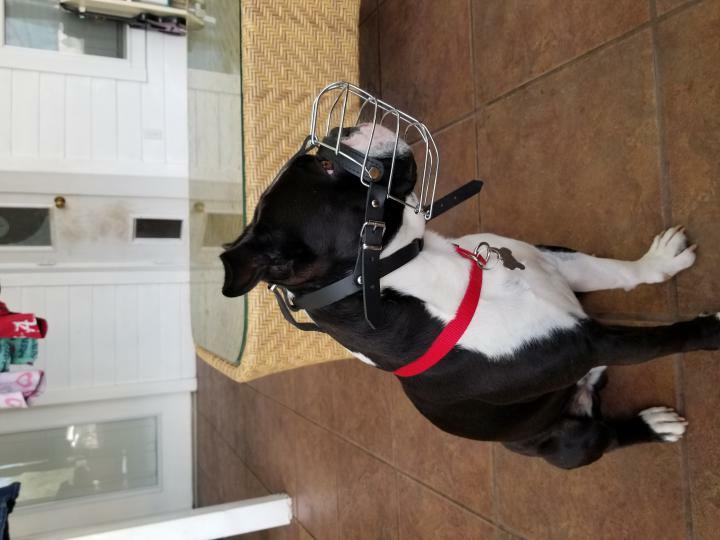 For help in learning how to size your dog for a wire basket muzzle, we have an instructional video here and a written article here that go into greater detail. I had been searching for a muzzle for my large Boston Terrier for a very long time and had no luck finding reputable sites that sell that type of muzzle. I had known about Leerburg for a while but didn't know they sold such a variety of sizes. The muzzle shipped very fast and was a reasonable price as well. 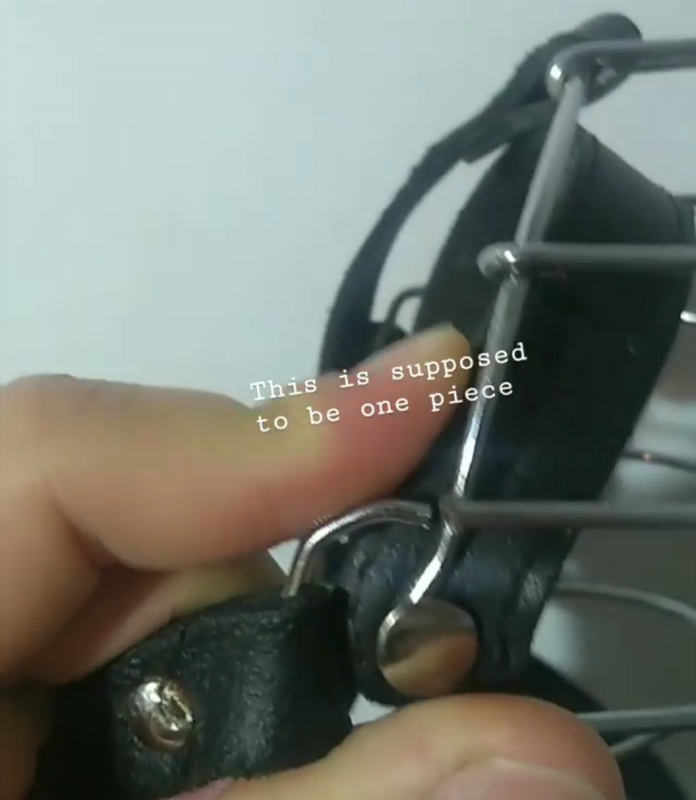 When i received it i had to make a few extra holes in the neck strap with a leather hole punch but it was no big deal. The muzzle is a little too large but thats what i expected, it stays on perfectly and serves its purpose rather well. I had a very old and territorial boxer. When my boyfriend and I combined households he would attempt to eat his labs, who were so sweet and defenseless against his size. A police dog trainer friend recommended this to me as a humane way for my dog to wear and get him used to the labbies. He HATED this (he was used to being my spoiled baby) but it worked wonderfully. He wore it when they were all together and learned quickly that on "breaks" he would stay out longer and longer if he was showing no aggression towards his new sisters. Within a few weeks, we only muzzled him if we had to leave them out together while we were gone. Within months, we didn't even need to do this at all. This was several years ago and my boxer was 13 when he left us, but was actually sweet towards his sisters. We now have another boxer and a rottweiler that want to be aggressive and territorial. So we are buying them each one. The labs, who are still with us, are sweet and non aggressive. We are going back with this model because they can eat, drink, pant and PLAY with them on. These are NOT pretty to look at, they actually look cruel. But they are the best training tool I have ever ran across. They are the most humane way to control biters that I have ever seen. THANK YOU for a great product. We are placing an order for 2 of these today. Just received my muzzle who I got for my german shepherd rescue who was a little too interested in my cats. This muzzle is so nice!!! Fits great and stays in place. Just what I needed. I highly recommend this muzzle!!! I absolutely love my wire basket muzzle I received from leerburg! It fit my American Bully perfectly. When I had some questions about the style of the muzzle Leerburg was quick and awesome with answering my questions. I had a very good experience. Now my girl Zoee and I can practice for her drag racing titles. By far a 5 star product and company. I ordered one of these muzzles about 9 years back. One of the best purchases I've ever made for my dog. Fit perfect to the measurements, stayed on during accidental fights, my dog knew he could drink and even figured out how to push kibble through the grate. 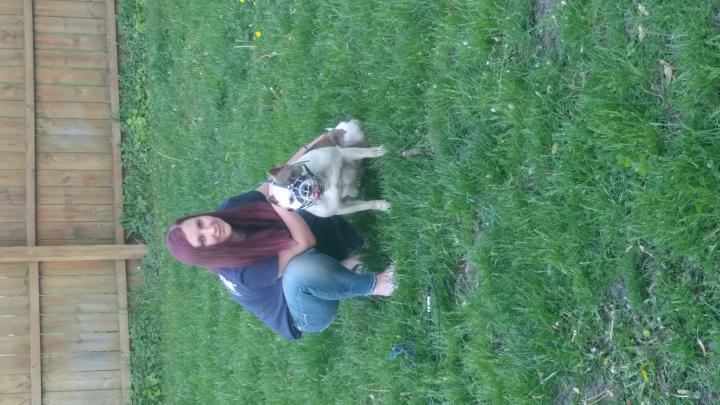 It survived several fights until we could resolve the underlying problem and kept my dog safe for many years of anxiety after the attacks while introducing him to other dogs slowly. My old one went missing and I will definitely be ordering a new one in the short future. Love this product and love this company for making it available to me and my boy. We are so grateful! I bought another muzzle before this one and it's night and day. Make sure you watch the video on baiting your dog so your K-9 looks at the muzzle as a positive thing. I only use this on the job or when I'm in a store. I must say the fit is perfect and just bait your dog very slow with the treats you can buy on this site and he or she will go into the muzzle to get the treat on their own without you holding it. I love it! I was doing a lot of research on muzzles for a move, one of my dogs in the past has shown aggression towards my other dog and I thought with the stress of moving this would be a big help. I looked up multiple brands, types and talked to several people. These are the only people who seemed genuinely concerned with my dogs well being and not just out to make money. The fit is great, she can have it on for long periods comfortably and eating and drinking is very easy for her. I would recommend these to everyone who needs a good muzzle, they're sturdy, built to last and comfortable. If I ever need another you bet I'll be coming back. Thank you guys so much for the piece of mind! We received our wire muzzle on Monday and it has taken less than 24 hours for my "sneaky" biter, Rey, to acclimate to it. I did just what Cindy did in the video with Rush. It makes me so happy that I will be able to go more places with him and have others enjoy his talents. In the past, I just never knew when or who he might decide to bite. He could be running an agility course a mile a minute and just decide that the gate person might need a quick bite. He never broke skin, or drew blood, but I had to quit bringing him out in public. He hates the cloth muzzle and will fight it, but this wire muzzle with plenty of room to breathe and lick and even enjoy a treat has just been a blessing. Thanks for taking the time to email me and explain about the measurements, etc. and the pros and cons of each muzzle. Leerburg has once again came through for me with another quality product. I purchased this muzzle for socializing my GSD that is territorial. Her attitude has changed greatly now that we have a muzzle that I feel she can breathe well with and move on to calmly work her on her socialization skills. The muzzle is a perfect fit. These wire muzzles were impossible to find locally but I again was able to turn to Leerburg to solve my problem. I'm looking for a couple more training aids I've found that our popular pet store doesn't seem to carry, but luckily Leerburg once again has what I need. Thank You Leerburg! This is a high quality muzzle from a company with great customer service. Give your pet time to get use to this and you'll have no problem There is a free video they have online to show how to acclimate your dog to the muzzle. I received the wire muzzle that I purchased for my German Shepherd and it is awesome. The quality is superb and I feel much better with him wearing it than the local store bought mesh muzzle I had been using on him. I can see that he is breathing comfortable and that makes me feel good as well because he always pretended that he couldn't breathe with the mesh one but now I know he is safe and not worry. He is a very nervous dog and I want to make sure that he doesn't get too nervous and nip someone. He hates to go to the vet for anything and I always put a muzzle on him when we go, especially when getting his nails trimmed. I found a trainer who is helping me to work with him so I can easily board him and we use a muzzle for the training as well or anytime he is around strangers. Thanks for such a safe and comfortable item for my dog. I would appreciate any tips for socializing him. Thank you so much for sending this great muzzle, it fits perfect on my dog! I have used your wire basket muzzle on a 3 year old foster rottweiler, Spencer, that has extreme fear-based aggression to people. Your staff helped me pick the correct size, and were very pleasant. It took only a couple uses before Spencer completely accepted the muzzle. Now, when let out of the crate, he will raise his front feet off the floor to put his nose into the muzzle! He knows he will only be allowed to be loose in the house with the muzzle on, and seems to look forward to it! It is excellent quality, worth twice the price. Actually priceless, considering the safety of everyone here. Thank you for such a quality product! I use one of these muzzles for my Bouviers French Ringsport muzzle exercises. It is still in remarkably good shape after 7 years; I want to thank you for continuing to carry them. I have a client who is looking for a muzzle and this is where I have directed him. This will be a lengthy review so I'll start with the pros and cons. I regret that I cannot rate this a 4.75 stars... the only reason I deducted a star is because I feel this muzzle should have more holes in the throat latch. My 53 # pitbull has a rather delicate & feminine head, and I had to punch more holes in my size A muzzle's throat latch so that it would fit her. Otherwise this is a 5 star European muzzle. This muzzle will last you a lifetime if you do your part and take care of it. I initially bought the FF muzzle, but really needed a size A for "pant-ability" in the TX heat. The staff at LB was remarkable as always and my exchange was effortless. Kudos to LB once again, you guys & gals are awesome!